One Direction’s Louis Tomlinson channeled aspiring model Ireland Baldwin this past weekend, when he added a large tattoo of an arrow to his growing sleeve on his right arm. Louis spurred rumors of a new tattoo on March 8, 2014, when he was spotted leaving Shamrock Social Club, the West Hollywood tattoo parlor responsible for plenty of One Direction’s tattoos, but it wasn’t until the following day that a photo of Louis’ new tattoo finally popped up online. 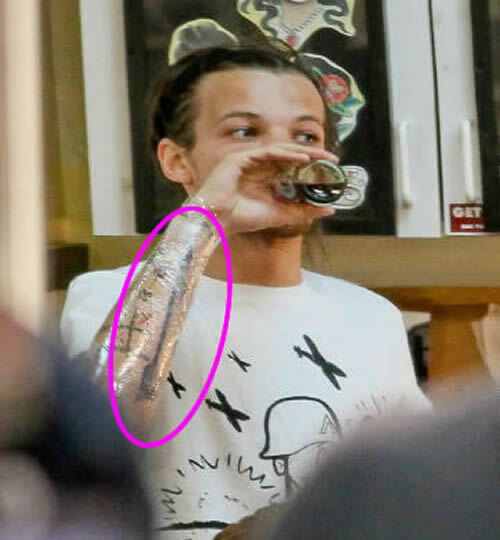 Although many photos leaked online made it look like his ink is located on his left arm, Louis Tomlinson’s tattoo is actually inked on the inside of his right arm, in between his paper airplane and globe tattoos, and the Pacman and tic-tac-toe tattoos he had done in 2013. 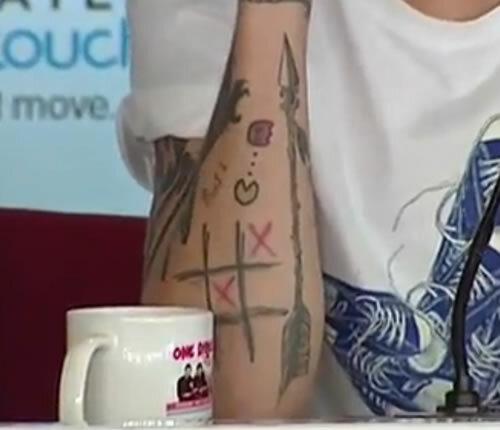 Louis’ arrow tattoo is inked in black and extends all the way from his elbow to the rope tattoo on his wrist. Plenty of celebrities have opted for arrow tattoos recently, including Miley Cyrus, Ireland Baldwin, Ellie Goulding, and now Louis, but their tats feature unique arrow designs and were all inked for very different reasons. While Miley’s small black crossed arrows tattoo is a Native American symbol of friendship, Ireland and Ellie both got arrow tattoos in honor of the Hunger Games movie franchise (Ireland is apparently obsessed with the films and Ellie contributed the song “Mirror” to the Hunger Games: Catching Fire soundtrack). Louis Tomlinson’s tattoo, on the other hand, probably has a very different meaning. An arrow is an important historical and cultural symbol, which makes it a great tattoo design, and many people get arrow tattoos that stand for friendship, freedom, protection, direction, power or peace. One of the most common meanings of an arrow tattoo is overcoming obstacles and rising above challenges, as evidenced by the popular quote: “An arrow can only be shot by pulling it backwards. When life is dragging you back with difficulties, it means it’s only going to launch you into something great. So just focus and keep aiming.” It’s a nice sentiment, but we have a hard time believing Louis’ arrow tattoo could be referring to challenges he’s facing in his life. After all, One Direction is about to launch its Where We Are world tour this summer and Louis and his girlfriend Eleanor Calder seem happier than ever. No, we have a feeling Louis Tomlinson’s tattoo refers more to friendship and direction than anything else, similar to the large chevron tattoo Liam Payne sports on his right arm as a tribute to his One Direction boys. How cute! sooo… nobody knows EXACTLY what it means?